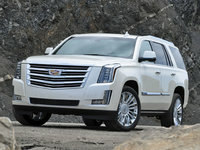 CarGurus has 7,224 nationwide Escalade ESV listings starting at $2,995. When a regular-size luxury SUV just won’t cut it for hauling family, friends and, oh, maybe a boat, Cadillac offers the redesigned fourth-generation 2015 Escalade ESV. This 7- to 8-passenger high-end sport ute still comes with body-on-frame construction, but adds some hefty exterior tweaks and a whole slew of interior improvements for this upcoming year. Also, the Platinum trim has been dropped for 2015, while the ex-Base trim is slated to be relabeled as the Escalade ESV Standard, resulting in this year’s 3-trim lineup of the now entry-level Standard, the midlevel Luxury and the newly promoted Premium. The stretched-out Escalade ESV once again flaunts some 10 extra inches of overall length over its regular-size sibling, with a wheelbase of 130 inches. That’s compared with the 116-inch wheelbase of the regular Escalade. Further, this stretched-out Escalade is touted to be stretched an additional 1.5 inches over last year’s edition, with an additional inch added to its width. Exterior tweaks for 2015 include a rear spoiler, a larger grille, restacked LED headlights and taillights, and reset doors. Inside, besides the folding third-row seat, expect the latest Escalade ESV iteration to flaunt brand-new perforated leather upholstery, a 12.3-inch driver information display and an updated CUE infotainment structure that includes the traditional 8-inch display and smartphone apps. And as a major coup, GM has finally figured out how to install a fold-in-the-floor third-row seat in its full-size utes, including the 2015 Escalade ESV. That’s right—no more hassling with the removal of that way-back seat for extra payload capability. But unfortunately the fold-up third-row seating results in cargo space being cut from a total of 137.4 cubic feet to 120.5 cubic feet. Also upgraded for this year is the standard 6.2-liter V8 powerplant. Besides boasting variable valve timing (VVT) and Flex Fuel capability (FFV), this big V8 is up-powered with direct injection (DI) technology to put out 420 hp and 460 lb-ft of torque, nearly 14% more than last year’s version. All this oomph is under the management of the quasi-economical 6-speed shiftable automatic transmission, with mileage figures this year improved to an estimated 14 mpg city/20 highway. Curiously, towing capacity is unchanged from the previous generation’s 8,000 pounds (with the proper equipment). Meantime, returning this year is the standard rear-wheel drive (RWD) configuration, while full-time intelligent all-wheel drive (AWD) remains available to any Escalade ESV trim. Standard appearance bling depends on the trim selected and should again include either 20-inch or 22-inch alloy wheels, side-steps, a roof rack, a power sunroof, trailer hitch and wiring, and heated reverse-tilt power mirrors. The cabin, meantime, again boasts, depending on the trim, that new perforated leather upholstery and folding third-row seat, as well as heated power-adjustable front seating and heated second-row seats. Also look for a heated steering wheel, memory for driver settings, power-adjustable pedals and full power accessories to adorn 2015 iterations. Cruise control and tilt-wheel steering each remain standard, of course, as do rear parking sensors, a rear-view camera, a remote garage door opener, power-folding rear seats and the new-for-2015 12.3-inch driver info display with updated CUE/OnStar/Bluetooth interface and standard memory-card based navigation. Again for 2015, entertainment and infotainment aboard the Escalade ESV will be anchored by a Bose premium audio system featuring a single-CD player, 10 Surround Sound speakers, satellite radio, NavTraffic and a memory-card slot. Options for the lower trims again include a bunch of stuff found standard in higher trims, while second-row captain’s chairs or second-row bench seats (for 8-passenger seating) remain available lineup-wide. Rear-seat DVD entertainment is once more expected to be optional for all 2015 Escalade ESV trims, as are power-folding side steps, upgraded wheels and added exterior chrome. Finally, look for the cornucopia of standard safety features in this princely SUV to be bolstered for 2015 by the addition of a couple of available safety packages. The Driver Convenience Package adds a safety alert seat, forward-collision warning, and lane-departure and blind-spot warnings, while the Driver Assist Package throws in automatic emergency braking, automatic collision prep and adaptive cruise control. What's your take on the 2015 Cadillac Escalade ESV? 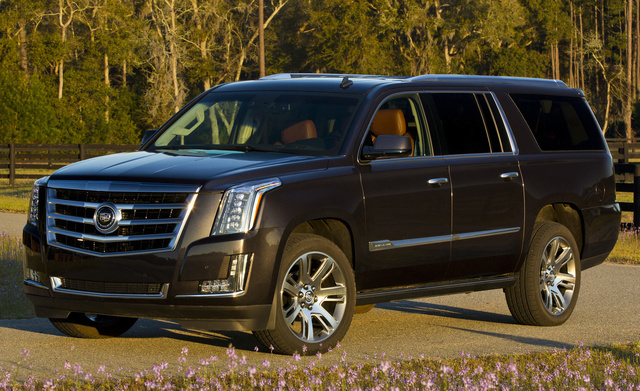 Users ranked 2015 Cadillac Escalade ESV against other cars which they drove/owned. Each ranking was based on 9 categories. Here is the summary of top rankings. 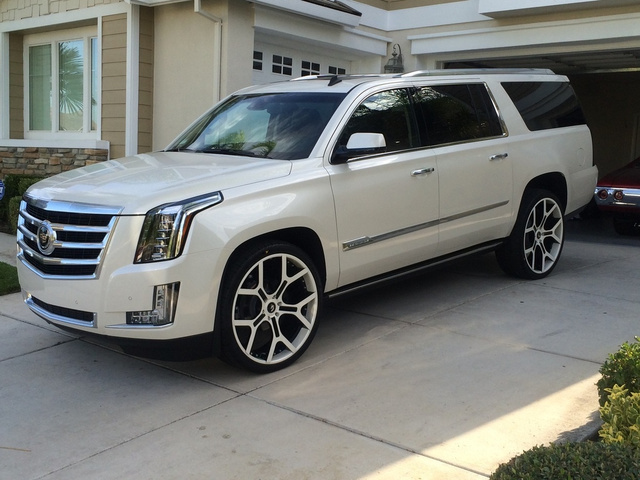 Have you driven a 2015 Cadillac Escalade ESV?